GoldieBlox is back, and this time, the brand's girl-power message is targeted directly at grownups. 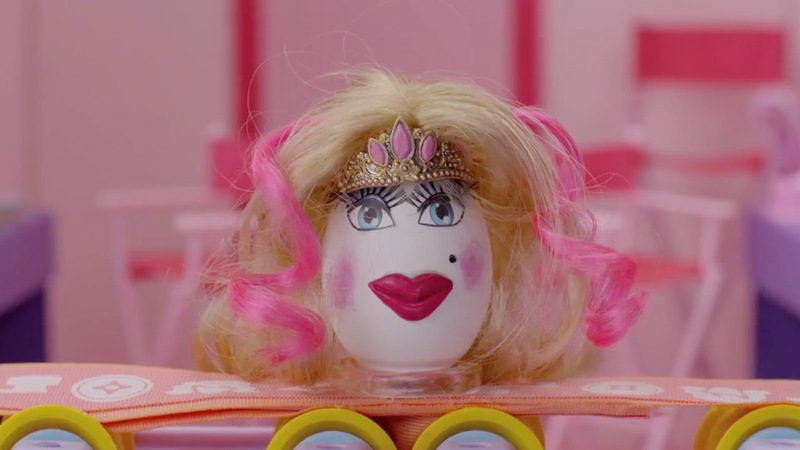 In a clever nod to the iconic "This Is Your Brain on Drugs" campaign (and right in time for Easter), GoldieBlox has created its own egg-centric spot, "This is Your Brain on Engineering," to illustrate the dangers of limiting girls' playthings to princess dolls—and, more important, the positive effects of exposing girls to science and engineering. The spot opens with a young girl in a lab coat (and fairy wings, because why not?) holding an egg. "This is your brain," she tells us, before setting the egg down on a conveyor belt made from a GoldieBlox toy set. "This is your brain on princess," she continues as the egg gets a princess makeover, crown and all. As the heavily made-up egg rolls along, we see a series of facts—"At age 7, girls begin to lose confidence in math and science," "At age 13, over half of girls are unhappy with their bodies"—implicitly linked to the prioritization of princess culture over "boy subjects" like math and technology. And then the conveyor belt ends, and the egg drops. But it's not over just yet, because now it's time to see "your brain on engineering." Rather than spattering on the floor, the egg lands on a GoldieBlox ferris wheel, travels via cable car to a roller coaster, and ends up in a GoldieBlox barn, where its dolled-up shell hatches to reveal a yellow baby chick. Along the way, we get some considerably more positive factoids—"Engineering jobs are growing faster than all other jobs in the U.S.," "Female engineers make 33% more than women in other fields"—encouraging girls to think beyond the pink conveyor belt and follow a more non-traditional path. Unlike GoldieBlox's first two ads (well, at least until the first one ended in a legal battle with the Beastie Boys), "This is Your Brain on Engineering" doesn't rely on a fun song parody about girls breaking free from princess prison. By that token, it's probably not as entertaining for potential kid customers as GoldieBlox' previous spots. But that's not the point this time. The point is to throw out some cold, hard facts (this is a "PSA," after all) and hope parents realize that the toys their daughters' are playing with now can make a difference long down the road.